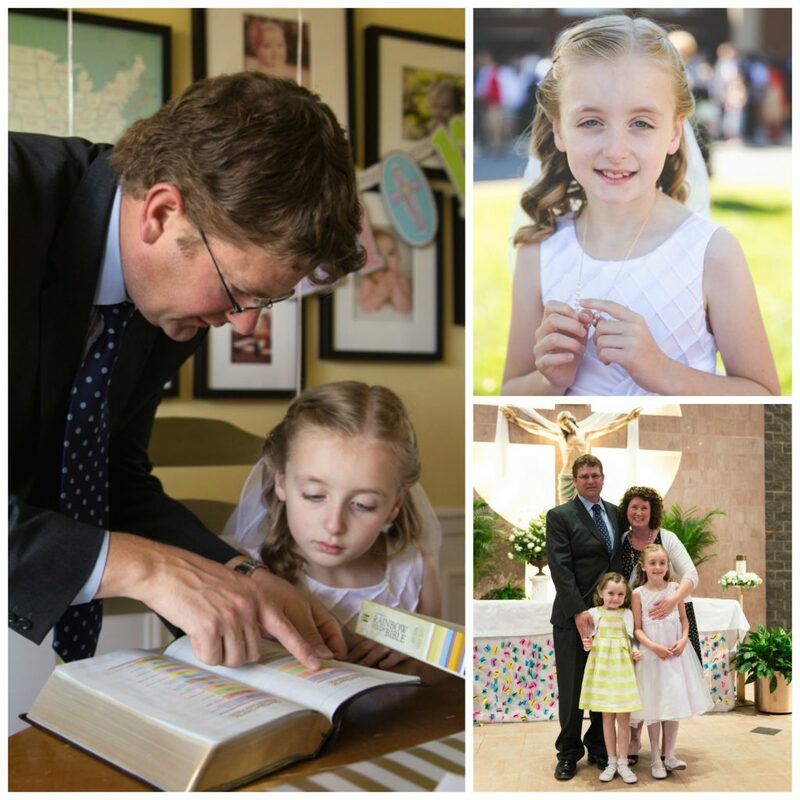 First Communion gifts are a great opportunity to give a young child in your life something special and memorable. 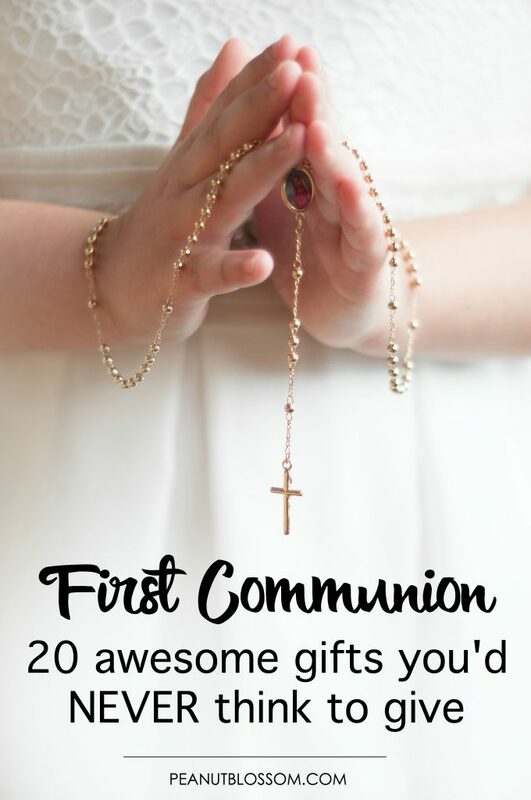 Their First Holy Communion is a big milestone in their life and by marking it with one of these unique First Communion gift ideas, you’re sure to make it one they’ll remember forever. Don’t miss these clever ideas for both boys and girls celebrating their holy day. Our Little Pea is preparing to take her First Communion in May. Our spring has been so busy, somehow my preparation for it got lost in the shuffle a bit. I realized this morning just how quickly it is coming up! She’ll be wearing the same dress and veil as the Peanut did when it was her turn, but with new shoes AND her very first pair of dangly earrings. When she got her ears pierced 2 years ago, we insisted on only studs. She begged and pleaded WHEN could she finally wear dangly ones? Somehow “You’ll be old enough on your First Communion Day” came to mind. It is such a special milestone, I know she’s going to feel extra grown up walking down the aisle in a sweet little pair of pearl danglers. 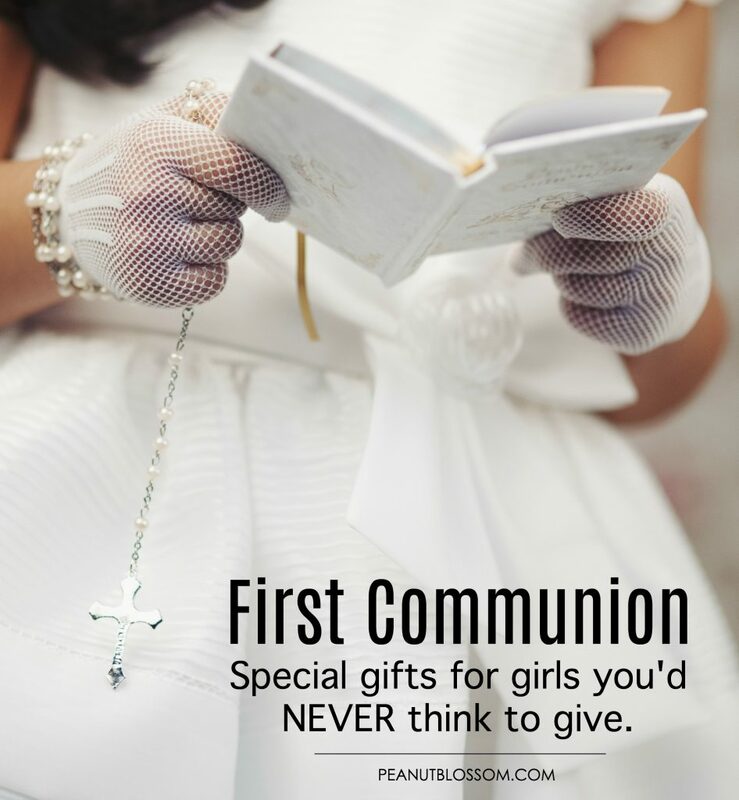 Finding a unique First Communion gift idea that will really mean something special to your child isn’t easy. So much of what is available falls into the cheesy nicknacks arena. 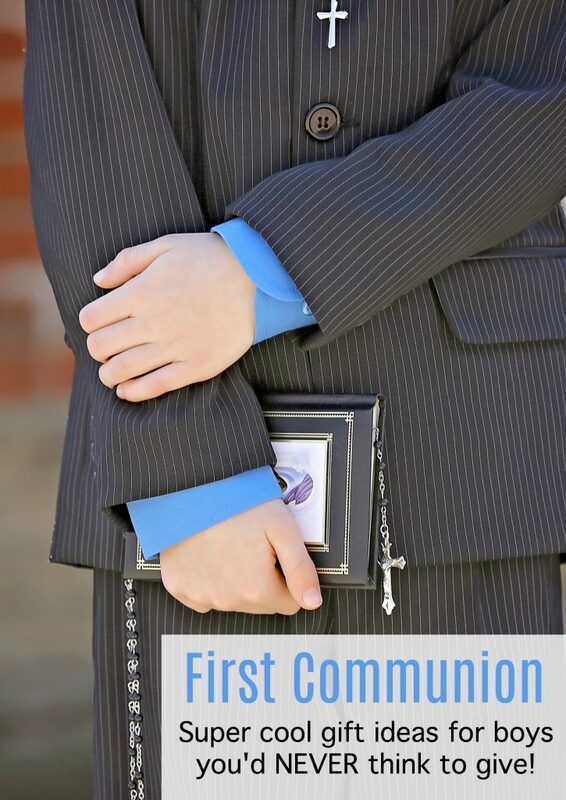 I wanted to share a few more clever solutions for your First Communion gift needs with suggestions that both boys and girls will love. Be sure to skim through all the sections, though! There are plenty of ideas in the boys section that girls might really love as well. It just isn’t First Communion without one or two traditional gifts for the Communicant. These gift ideas are classic for a reason: they are sweet and special and something the child will appreciate over time. For parents and Godparents, this is an excellent place to start. Dear Pope Francis: An excellent book of letters from children to the Pope. His responses are utterly heartwarming. Read more about it here. Picture frame with photo of the child with their Godparent on their Communion Day: There are dozens to choose from, see some lovely examples here. First Communion Bible for children: Get the Bible here. Catholic Book of Saints for Children: Get the book here. Tiny Saints charms: Perfect for backpacks or collecting, they even have a sweet rosary that is just perfect for kids. Check out their adorable illustrations here. If you’re the “cool aunt”, grandpa with a sense of humor, or you know for certain your child will be receiving at least one classic First Communion gift, maybe you want something a little more unique and memorable to mark their Holy day. Put a little extra effort into wrapping the gift and writing a note to explain the connection. These fun instant cameras are perfect for encouraging a child to notice God’s amazing creations all around us–both natural outdoor beauty and His love inside the child’s friends and family. The Instax Camera comes in several color options here. There are adorable albums available separately or you can buy an entire kit with film here. While any Lego set would do, we couldn’t help giggling over this AMAZING Fr. Leopold celebrates Mass set. But simply attach this card to your Lego set of choice and direct them to this fantastic “How to build a Lego Nativity set” to inspire them to create spiritually themed things. What better way to remember their first taste of the holy bread and wine than by spending time breaking bread with family in the kitchen? Give them a children’s cookbook that has sections for both the kids and the parents to work together to create a dish everyone will love. Get a copy of The Ultimate Kid’s Cookbook here. Give them something to tend to and care for that will remind them of their special day. This glow in the dark terrarium is sure to be a huge hit with kids. Get the science kit here. A neat way to remind kids of the wonder of God’s creations in this world is to give them any number of science kits. This crystal growing set would be popular with both boys and girls. Get the science kit here. This would be a classic gift from a grandpa, dad, or uncle to either a boy or a girl. Choose the tool with the options you feel most comfortable with, there are so many options and colors to pick from here. Coming up with Holy Communion gifts for girls tends to be a little bit easier since there are so many jewelry items you could give. I tried to come up with a few more uniquely memorable items as well but be sure to browse the boy’s section below, because there are several items there that I think many girls would love, too. Start an add-a-pearl necklace: This lovely tradition is a sweet way to have a simple gift all figured out for many birthdays, Christmas, and milestones to come. Read more about the lovely tradition here. Earrings: This would be a great milestone for allowing your daughter to pierce her ears. Little Pea already has hers done but she had to wait until First Communion before we allowed any of dangly designs. Rosary bracelet: A unique and sweet way to keep the prayer tool handy. So many options to choose from here. A Nativity set: This is something she can keep for life and display every year at Christmas to remember you and her holy day. We love this simple set here. The Unicorn Prayer Journal for Girls: Any gratitude journal would be a lovely idea but this unicorn one caught my eye and made me giggle. What a unique spin, check it out here. Since I don’t have sons myself, I asked around for some help from my friends on clever Holy Communion gifts for boys. The ideas that came back were so great, I’m sure you’ll find something you’re little guy will love. The Gratitude Journal for Boys: Remind him to count his blessings with this adorable journal covered with a rocket ship and space theme! Get the journal here. Rosary for boys: This hysterical article “manly rosaries for manly men” made me snort out my Diet Coke, but his examples included are awesome. Cordless drill: Include a note that says: “May you be a humble builder of God’s kingdom.” Perfect grandpa gift if ever there was one! Watch: A great way to make the little guy feel more grown-up, an accessory like dad wears. The Ultimate Kids’ Cookbook cover reveal and sneak peek! It was well worth the sacrifice to have discovered your post!